Everyone is familiar with the traditional world globe but I doubt you have seen before something like the gemstone world globe held by a human hand sculpture, as seen in the picture below. It’s ideal as a table or desk accessory, whether in the home or the office. The globe, made from 24 Grade A gemstones can be spun in the grasp of the expressive and realistic-looking human hand which has a flat and secure base for placement on any surface. The globe itself comes in a variety of different color options. These include Aquamarine (as seen in the image above), Black Onyx, Peridot Green, and Rubellite, to name but just four. The metal hand comes in two different options, which are gold (as seen) and pewter. 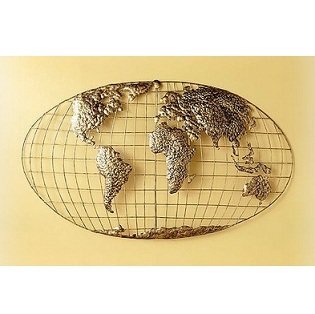 Each different design option will give you an excellent choice in matching this quite remarkable world globe with existing décor and table features. 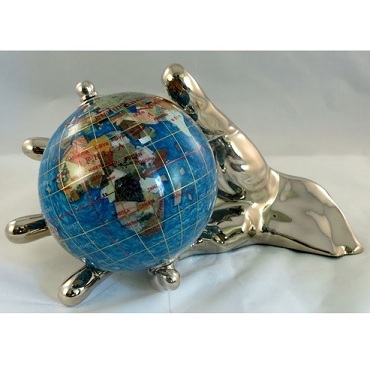 The sculptural globe is an excellent gift idea for anyone you know who loves geography, world travel or who does a lot of business with clients and partners worldwide. You can buy it from here: Hand Held Gemstone World Globe. Great as a fun educational tool for children too. All aircraft enthusiasts will be aware of the Lockheed Constellation Airliner which was first built way back in 1943. The propeller-driven aircraft was the forerunner to today’s high-tech passenger jets and the famous, but now sadly obsolete, Concorde. 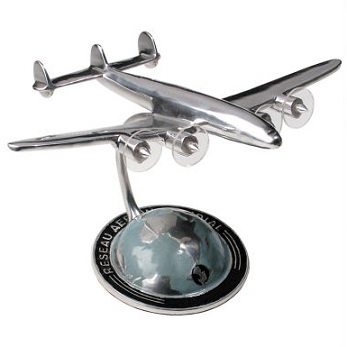 In memory and indeed in celebration of the Constellation series, this miniature Constellation airplane sculpture in a traditional airline travel agent style has been made for plane enthusiasts and aviation history buffs everywhere. In fact, you don’t have to hold a fascination with aircraft to understand and appreciate the significance of these early trans-Atlantic airplanes which were powered by four 18-cylinder radial Wright R-3350 engines. Many of you will have been on them in the past when they were regularly in service from 1946 to 1967. The series was also involved in military activities up until 1978, mainly as transport planes for ferrying troops from one location to another. The Constellation airplane sculpture is made to sit securely on a desk, shelf or special platform from where it can be viewed and admired. A globe of the world forms the base along with the inscription “Reseau aerien mondial” which is French for “Global Air Network’. As one might have guessed, this particular sculpture is based on the Constellation owned by Air France, which is the same as those from Pan American World Airways (Pan Am). France is significant in the history of this plane series for the first transatlantic service for ordinary people was flown New York to Paris on February 6, 1946 by Trans World Airlines. Plus, as noted above, as well as various American airlines owning the series, Air France also had a fleet. Later, other airlines would also purchase the series, including KLM, Qantas, Lufthansa, Iberia Airlines and Trans-Canada Air Lines. For a touch of history and aviation flare, this sculpture will make an ideal addition to a room in your home and will certainly offer a talking point among visiting friends, family and guests. You can buy it here: Miniature Constellation Airplane Sculpture. Finding a quality globe bar for your favourite drinks and glasses can be an uphill struggle. However, this Sixteenth-Century Italian replica I recently came across brings the functionality you need with a small home bar table and the aesthetics that go with classical antiquity. 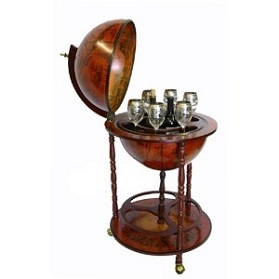 It is a replica but if you’re looking for an old world globe bar then this handcrafted piece is a very affordable and a marvellous alternative to an astronomically priced original. 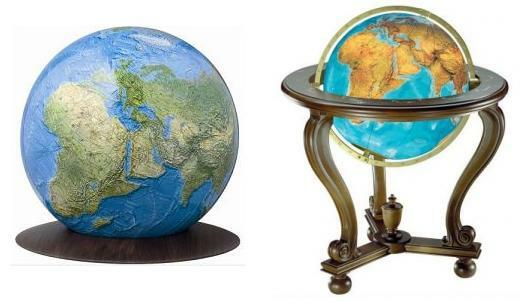 The floor standing globe bar has been made to match as near as possible the real globes from the 1500s in Italy. Similar materials have been used and the same skills employed so as to bring the replica very much as close as possible to the real thing. The globe will appeal to men especially due to the geographical elements of the map designs. If you’re considering buying a gift for a special man in your life, who perhaps loves cartography and history, and who also likes a drink, then this globe bar is an ideal choice. Room enough inside the globe for spirits and crystal stemware, the attractive old-world globe bar will function as an accent piece as well as its main storage feature. Placed in a home bar, library or dining room, it will become a firm favourite with visiting guests and a simply irresistible highlight for card playing evenings, movie nights or for quiet periods of reading and writing in a study. Read more about it here as well as the positive reviews: Sixteenth-Century Italian Replica Old World Globe Bar .